This ultraviolet light adds an air of mystery and excitement to any visual effects show. Traditionally, UV lights were bulky, heavy and radiated a lot of heat. 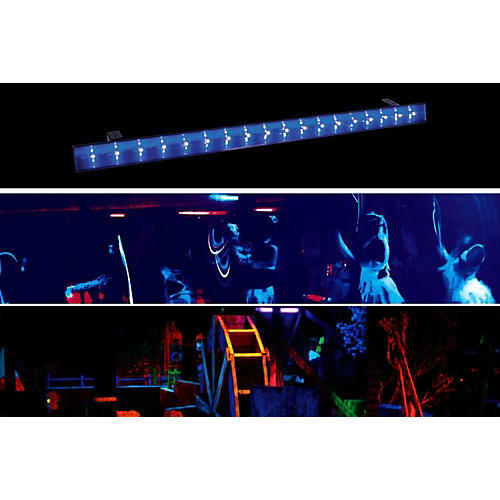 The ECO UV BAR DMX combines the allure of black lighting with the efficiency and ease of cool-running LED technology. It also offers the simplicity of manual operation as well as the user control of DMX-512. With its wide, 120-degree beam angle this ultraviolet LED fixture provides wide coverage and is great for performance stages, theatrical productions, special effects installations and mobile light show.